From Uyuni where the salt flats are, many travelers will select the route that goes to the Atacama Desert in Chile and cross the border that way. 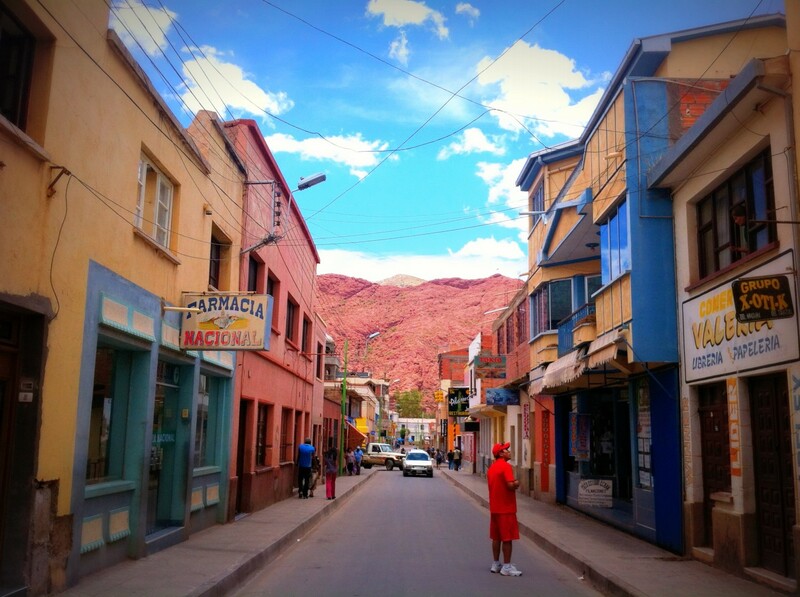 Instead, I chose to head to Tupiza from Uyuni by bus and cross over to Salta, Argentina. 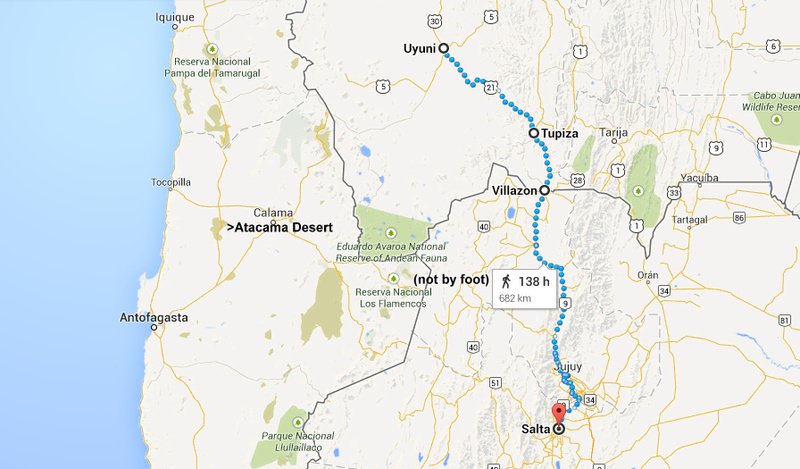 You can book by bus to Tupiza via Potosi, about 7-8 hour ride, or you can take one of the few trains available in South America for 5-6 hours. The train runs every other day and it’s best to book ahead. There was only one ticket window open when I went and if it’s office hour and no one’s there, just wait. The red arrow is where the entrance to the train station is. Look for the sculpture next to the town square. I booked the Expresso del Sur Executive class for $17 USD with pre-assigned seat because I never got to try full cama on buses, plus it was a late night ride where I read the cabins can get very cold, which it did. The executive cabin offered pillows and blankets for which I realized I would’ve been miserable without. Upon arrival in Tupiza it was 3:30 AM. 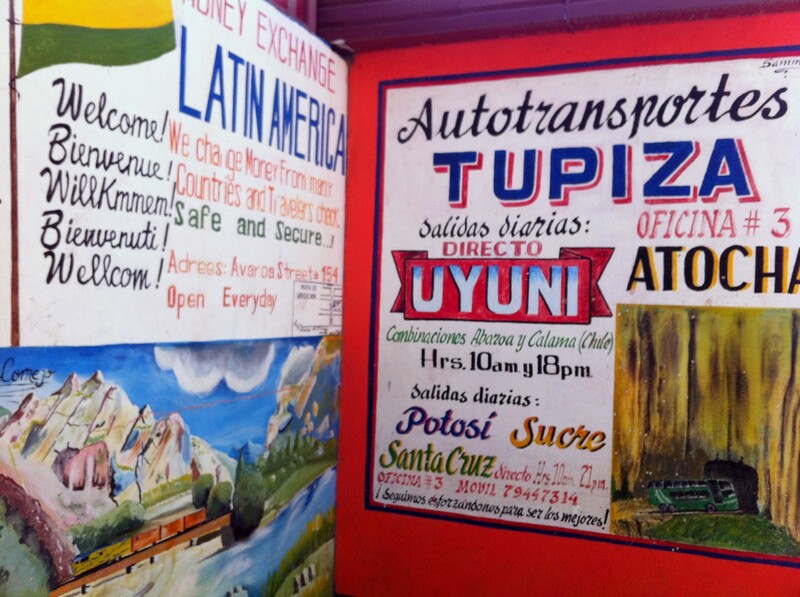 Tupiza is a small town and fairly easy to walk if you have companions. Being by myself, I opted to cab to the hostel which was less than a mile away for $1 USD. What’s so special about Tupiza? 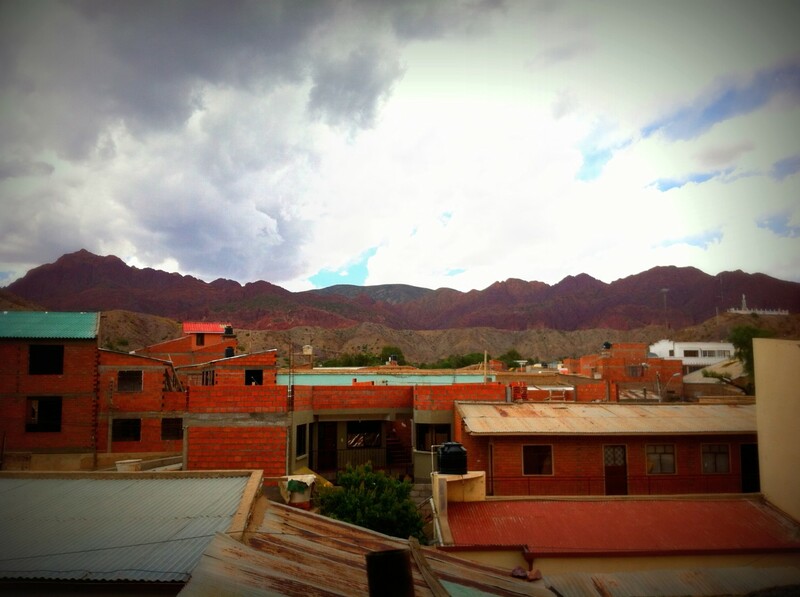 With the red desert peaks as its backdrop, Tupiza does look a lot like Arizona. The town was lively though, not empty with tumbleweeds. My first day there was spent in recovery and only walked out within a few blocks in search for food. I stayed at La Torre hostel, one of the few options in town, the rates are cheaper if you book directly on their website. La Torre is also a tour agency with decent reviews. 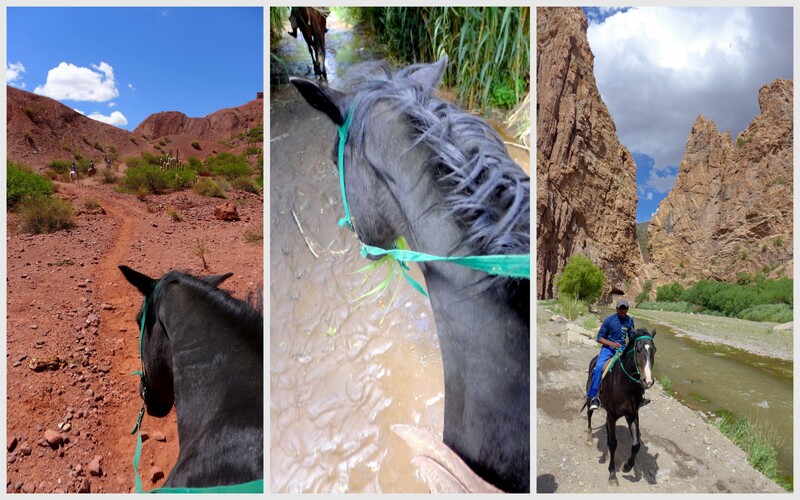 On day two I began asking around about the full day horseback riding tour. I started with La Tour and went to two other tour agencies, and the conclusion I got was there’s really only ONE tour operator in Tupiza. All the tour agencies were calling each other to form the group. That’s when I realized how tiny of a town Tupiza was. The view from La Torre hostels terrace. I waited another day to have enough people wanting to take the same route. 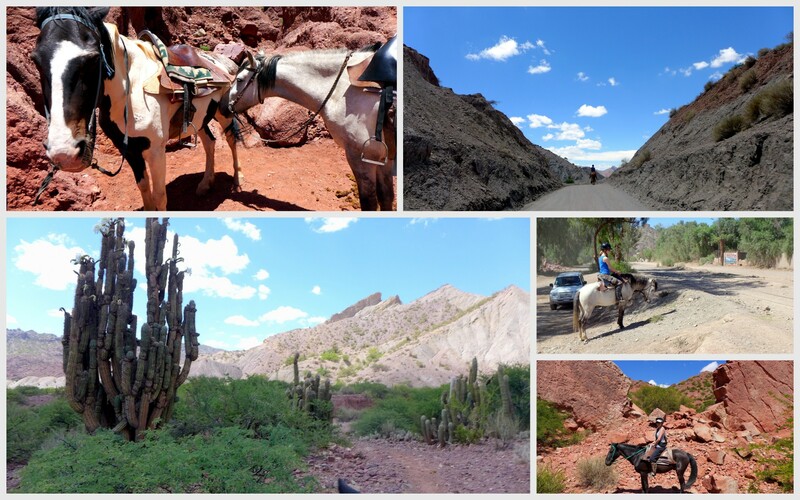 The full day horseback riding tour includes Palmira, Puerta del Diablo, Valley of Males, Cañón del duende, Toroyoj, La Torre, Entre Rios, and El Angosto. Knowing the propensity for heat in the desert, I had on a tank top and equipped myself with 100% SPF sunblock. At 9 AM (considered quite early in their culture), an Irish girl, an English dude, and I met our guide, Miguel and walked over to get our horses. Sceneries along the way. Raw desert and oasis. Why did Butch and Kid come here anyway? The horses were all in healthy condition and of Argentine descent, arguably the best breed money can buy. You will notice the difference too from the larger frame, proud and consistent strut, and what seems to be an endless supply of energy. Miguel said each horse costs $2000-$3000 USD, that’s no small amount in a town where you can get by luxuriously for $20 USD a day! Seriously wonders if they left any treasures in this no-mans land…. 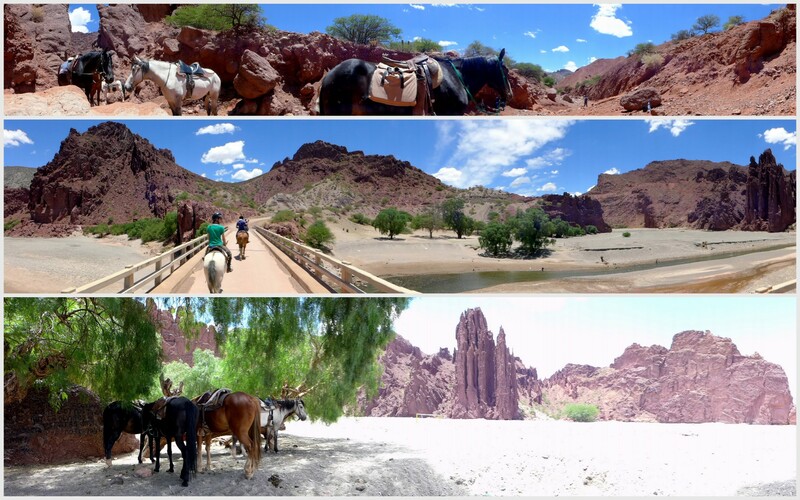 The tour took us through desert valleys, oasis, bamboo forest, wide river crossings, cactus land, gorges, rocky shores, and more desert peaks. I felt the urge to knot a rope and chase some goats down (but I didn’t. There were goats and ropes but no skills.) Miguel even took the lead to race and gallop a couple of times. My horse with a very distinguished personality who will NOT, for the life of him, allow another stallion to pass. I did not expect much from a town center made up of 5 blocks of commercial stores, especially after the lackluster food selection in Uyuni. However, the choices I came upon was amazingly authentic and tasty! No directions, just circle around and look for a place where the locals are, you won’t need to walk more than 5 blocks anyway. Oh, and there is a morning market by the main bus stop that serves some awesome street food and drinks. Must go early, before 9:30 AM otherwise the good vendors sell out and leaves. 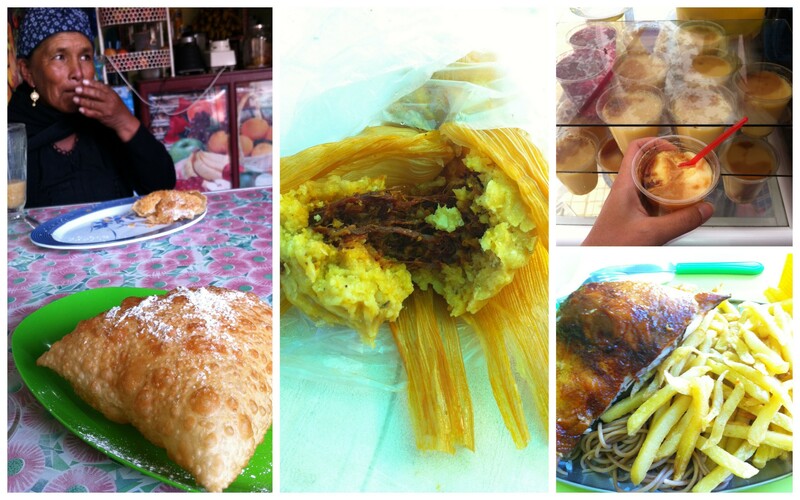 Randomly off the streets were the best tamales Ive had in my life. Flan for breakfast, roasted chicken, and puff pastry for dessert. Not to mention the lady who introduced me to Api! Food at the restaurants. Chicken soup, spinach noodles, milanesa. Always look for menu de dia! The surprises just kept coming. 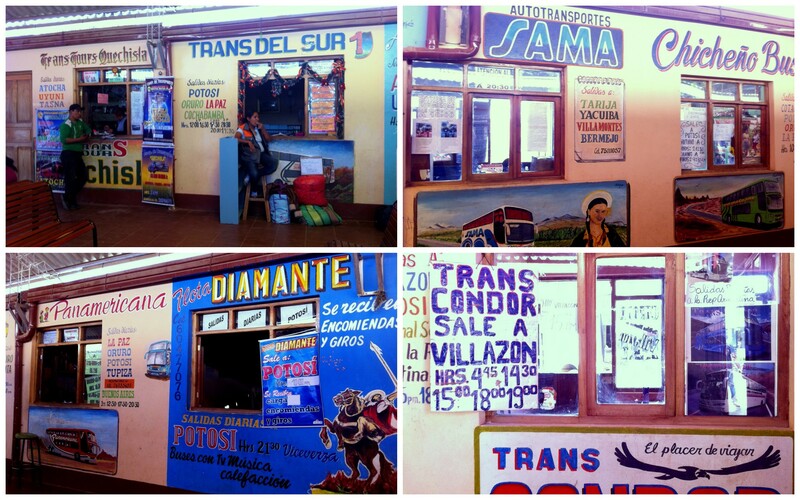 Since I arrived by train at a separate station, my first impression of the bus station came when I was looking to book a bus to Villazon, a town in southern Bolivia, on the border with Argentina. A ten minute walk from the hostel, I grabbed a nice stuffed pastry off the street and found the bus station that looked as if Tribeca hipsters took a field trip down to Tupiza. Sign outside the station facing the street. Each bus company has their own style and graphics. It was a treat just walking through the ticket booths. After being in so many bus stations in South America, this one is definitely unique and full of character. But which company to pick? If you’re going to Sucre or Potosi, the company Juarez C. and 11 de Julio are your two best choices. For Villazon, it’s a short 1.5-2 hours trip ($3 USD) and you can just show up any day to catch the morning or evening shuttle. The morning is recommended as the line can get very long at the border to Argentina. 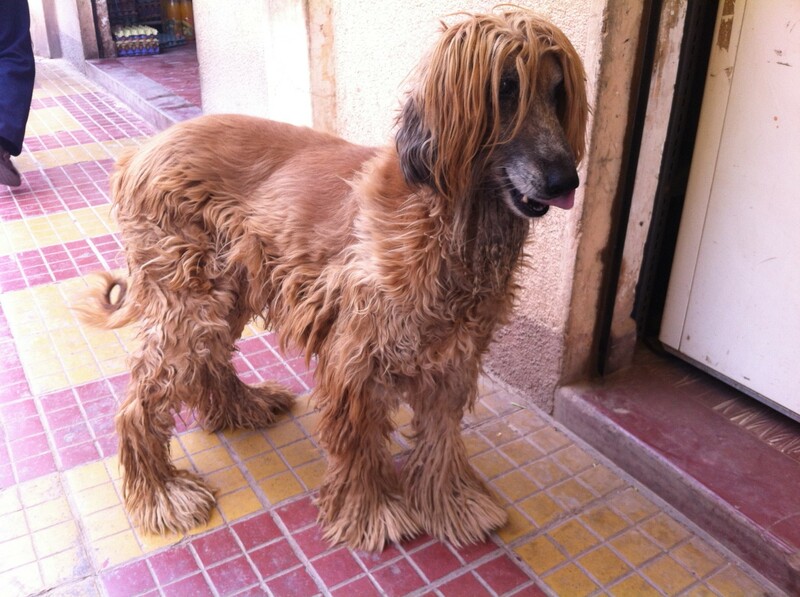 Not share how this breed got there but its one of the grocery store owners dog. It was a lovely 5 days in a lovely town. Small but robust and full of very curious people. The tourism industry is no doubt getting more attention as people travel to Uyuni and down Argentina. I’m sure if I get to visit again, it might be very different. For now, it has everything good about a small town with friendly and welcoming residents. 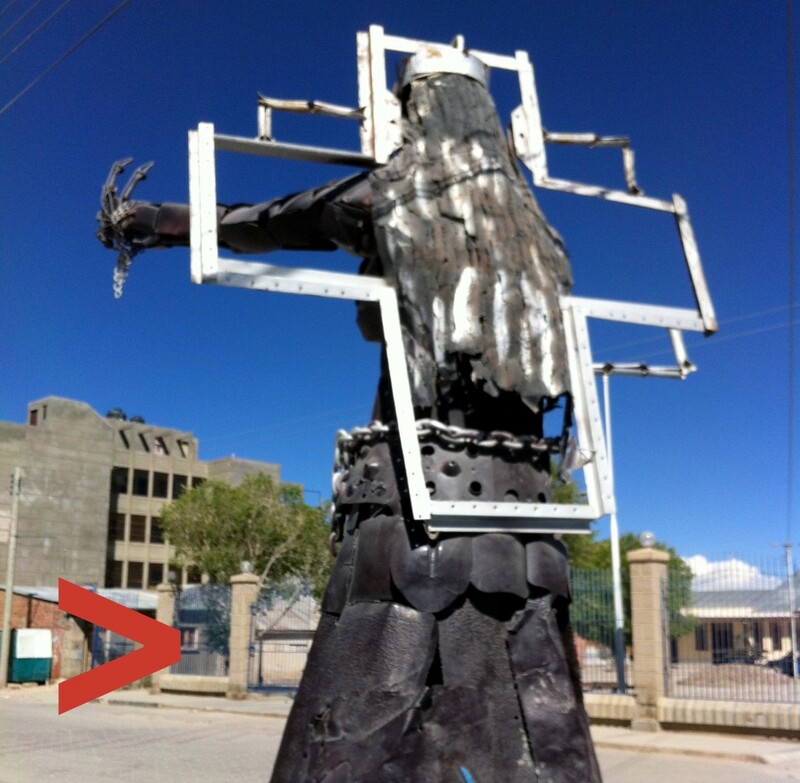 If you’re visiting Uyuni, don’t miss out on Tupiza! Previous story STEAL these Awesome Gear Deals!